There is a video at the bottom of the page for a visual walk through. 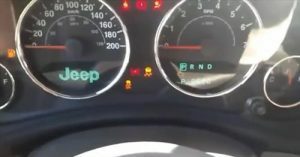 If you have a check engine light come on in your Jeep Wrangler there is built in diagnostics that show the code. After the code is read it can be Googled to find the problem. The steps are simple by cycling the key from Off to On three times and the code will flash once on the dashboard LED. Do not start the vehicle only turn the key to the On position. 1… Turn the Key from OFF to ON three times. 2… The last turn of the key should be in the ON position. 3… The code will show for only a moment than flash P-done before going back to normal. Here the code P0520 is displayed on the right below Park, Reverse, Neutral, and Drive. Typing P0520 into Google it shows that it is a Engine Oil Pressure Sensor. This method may not work for all Wranglers and there are many low cost scanners that can give the codes along with more information. Most automotive stores will also do a free scan and give the code if a scanner is not available, be sure to call a store first. 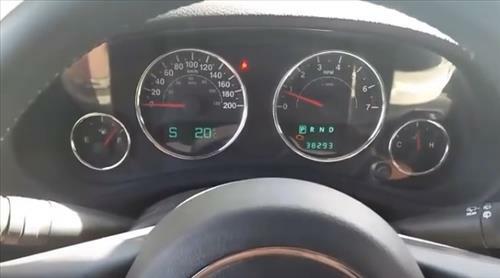 If this method works for you let us know in the comment below as it is a good quick way to troubleshoot a jeep in a pinch. Just purchased a 2012 60hp Mercury outboard on bass tracker boat and is Surging/bogging at mid speed… Runs ok at lower speed and at full throttle… Mid speed is when it happens…. Your diagnostic help would be greatly appreciated!